Many developers know about this battle between emacs and vim. Well, not exactly between editors themselves, but rather between their fanboys. As for me, I started with gedit, default Gnome, therefore Ubuntu, text editor. After adding a couple of plugins, most importantly, dummy code completion it worked well for couple of months. Yes, I know, it takes time to learn it, even more time to get used to it, but when it is in your muscle memory it is extremely comfortable. But I still have different issues with it. I almost can't use Rope, code completion is almost as dumb as gedit's, and configuring it is cargo-cult for me :). 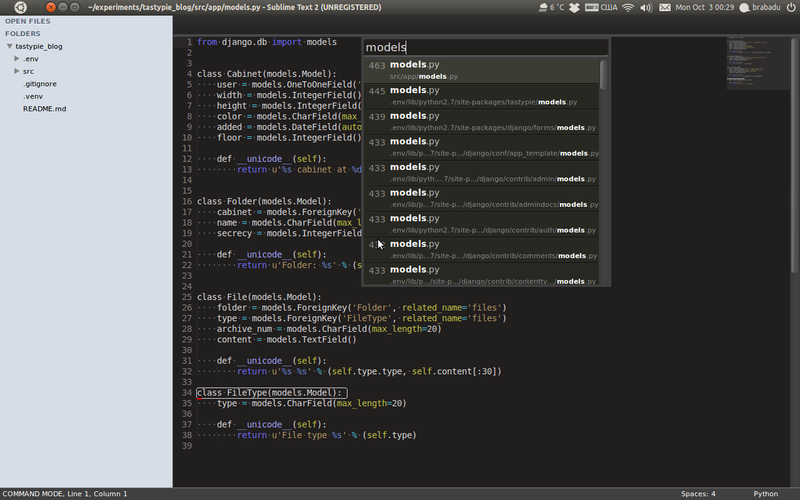 Text editor Sublime Text 2 is starting to gain more and more attention. It is multiplatform, quick, nicelooking editor with a couple of very interesting features. One of the mostly used ST2 features is it's function for opening files from project. You can press Ctrl+P and start typing filepath and it will give a list of matching files. You have to create project first, to use this function. It works great and became very handy way to move between files. Other options is Ctrl+Shift+P - same kind of text input opens and you can start typing a command and it will filter it for you. For example you can type Rope and it will show you all the commands of rope on first place, and then other commands that have letters r,o,p,e in it. It is hard to explain, you should try it for yourself and you'll understand it quickly. Moving between methods is not harder - Ctrl+R and you see a list of methods in current file, can filter and quickly jump to their declaration. Most surprising feature for me is vintage mode. It is a simulation of VIM's most commonly used commands, such as ghjk-navigation, commands for copying, deleting, pasting, inserting etc. But miracle didn't happen, it is quite restricted. Using motion commands isn't as consistent as in vim. ESC doesn't clears command, so if you typed d, you will delete something, no matter how many times you push ESC button. Vintage mode is made completely on keybindings, so maybe it is possible to fix some things, but I think emulate whole vim's behavior would be overkill. Other great advantage of ST2 is it's configuration file. You can build your own from scratch, referring to default one, which is pretty well documented. Configuration file is json, so you don't have to learn another configuration language. My (tiny) configuration file is on github. SublimeRope is an attempt to bring powerful library Rope into Sublime Text 2. Rope can do a lot of IDEish things with python code like extracting methods, searching for docstrings, going to definitions, renaming etc. At the moment it can do only renaming and moving to definitions but github repo is being updated time to time, so I hope we will see more features in future. SublimeLint became a big discovery. I knew lint existed, but never actually used it. It can show you different warnings and errors like those big compilers have: variable declared but never used, unused imports, syntax errors and PEP8. This is not the best explanation what Lint is though :) It can make editor a bit slower, but you can turn off background linting and turn on when you need it again. Autocompletions in ST2 is what I still don't understand. Quite often I can't predict what suggestions will it give, especially what it will autocomplete with Tab key. Everybody is talking about minimap. I can't say anything about it. It is interesting way to find your place in file, no more, no less. As a summary I think sublime can become my default editor. I use it for a week already, and though I miss some vim specific features, I like it very and very much. I think I'll try to do a reversed path. I want to try recreate all things i liked so much from ST2 in vim. Depending on results I'll choose one of them to use day-to-day.